At an Elvis impersonator convention in Birmingham, England last week one performer attacked another for allegedly fooling around with his wife. Though it may sound like a scene from a movie Elvis might have starred in, the real-life incident was no stunt. Michael Cawthray of Wales is accused of assaulting Jeffrey Burton on January 9 at the European Elvis Championships. Burton's father James had played guitar with the real Elvis. The annual three-day Elvis tribute convention, which is organized by Cawthray and held at the Hilton Metropole hotel, had about 80 impersonators competing to win the championship. The incident took place shortly after Burton finished his act in front of more than 1,000 fans, reports the Daily Mail. 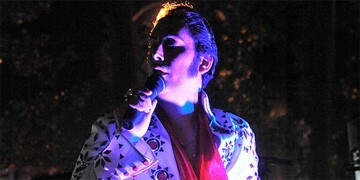 "Many of the Elvis tribute acts and fans were enjoying a post-convention drink in the bar," a source tells the paper. "I headed toward the lifts when Jeff suddenly emerged. He was struggling to stand and was bleeding from the mouth and nose. His face was swollen and it seemed surreal. Jeff said Michael's wife had come to his room for a nightcap and that when Michael discovered where she was, he assumed the worst." Burton was taken to the hospital and kept for two days for treatment. A West Midlands Police spokeswoman says, "Police were called at 4:25 a.m. on January 9 to reports of a man bleeding in the lobby area of the Hilton Metropole Hotel. A 48-year-old man was taken to Heartlands Hospital with a broken cheekbone, a broken nose and cuts to his face." Cawthray faces a single count of assault occasioning bodily harm and is due at Birmingham Crown Court on March 15, reports the BBC.